That image is a cute little lighthouse called the West Breakwater Light. 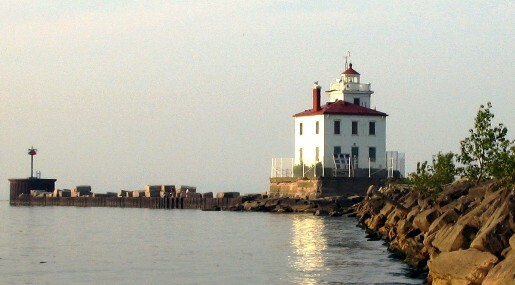 It’s on the shores of Lake Erie in the picturesque town of Fairport Harbor, Ohio. It’s northeast of Cleveland, far enough from the city to have this kind of pretty scenery, but right now the town is a ghost town. All 3,200 residents of Fairport Harbor, Ohio, have been evacuated due to natural gas fires and explosion risk. The fires are believed to be caused by pressure problems in the aforementioned natural gas pipelines. It seems a bit excessive, but a little natural gas goes a long way, especially when it’s highly pressurized like in those natural gas pipes. Remember the San Bruno neighborhood explosion? Well, these natural gas pipelines run beneath the entire town. It’s no wonder Lake County officials decided to evacuate everyone; otherwise they might all be blown to Hell, literally.